Templo Mayor - Visiting Mexico City is an exciting proposition, one that promises the traveler many opportunities for adventure. A grand metropolis with one of the world's largest populations, the city is an international destination for many travelers. Today, Mexico City offers the visitor the chance to explore one of the most extraordinary archaeological discoveries of the 20th century. Located in the heart of the city, the Templo Mayor Museum and ruins are a must-see when visiting Mexico. In 1978, a worker digging a city construction project near a downtown cathedral hit something big and hard with his shovel. The object in question was a 500 year old stone sculpture depicting an ancient Aztec goddess. This huge stone sculpture was no ordinary find. 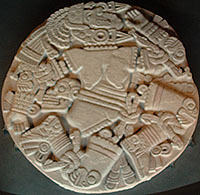 An incredible work of art depicting the moon goddess Coyolxauqui, this sculpture was the tip of the proverbial iceberg. Archaeologists were immediately summoned to the site and what was determined next was nothing short of incredible. The scientific community conceded that this magnificent sculpture provided evidence that what lay hidden underneath the streets of modern day Mexico City, was in fact, the ruins of the ancient Aztec capital of Tenochtitlan. 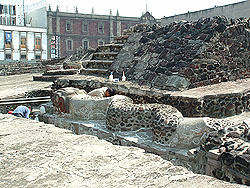 More astounding yet, the ruins appeared to be those of the capital's great pyramid, the Templo Mayor. It has long been known by historians that the Spanish conquistadors, upon seizing control of Tenochtitlan in 1521, destroyed the Aztec city in order to establish their own. Temples were torn down and priceless artworks decimated. Spaniards built atop the structures they had razed, thereby erasing any vestiges of the once great city of Tenochtitlan. These ancient ruins and their mysteries, which are still unfolding, may have forever remained submerged underneath tons of rock and concrete, had it not been for that city worker in 1978. Mexico was initially hesitant to destroy historic colonial buildings that lay atop these ancient ruins. Nonetheless, the decision was made to do just that. The legend surrounding the founding of Tenochtitlan is one that still lingers in the collective consciousness of Mexico today. Indeed, the country's flag represents this legend graphically. An eagle is depicted, perched upon a cactus, devouring a snake. This was the sign that the ancient Aztecs sought in determining where to build their temple. According to legend, the Aztecs did encounter such an omen and the construction of Tenochtitlan and its great pyramid, the Templo Mayor soon commenced. Construction on the temple began in 1390. When it was completed in 1487, in order to commemorate the event, thousands of people were sacrificed over a 4-day period. The temple stood 200 feet tall with dual shrines atop its precipice. One shrine, dedicated to Huitzilopochtli (god of war and sun) stood adjacent to the shrine dedicated to Tlaloc (god of rain and fertility). Today, when visiting the site, some artifacts remain "in situ", giving the visitor the opportunity of seeing the objects in their original setting. However, the site's museum houses the majority of artifacts excavated thus far, approximately 6,000 objects. One terrifying discovery, the Wall of Skulls, features panels of real human heads covered with stucco. The museum also showcases two clay statues of Aztec warriors, life-size and resplendent in eagle costumes. Excavations are ongoing with one currently in progress that promises great rewards. Archaeologists believe they have uncovered nearby the tomb of Emperor Ahuizotl, the ruler of the Aztecs when Columbus landed in the New World and uncle to Montezuma. This would be an extraordinary discovery. To date, a royal burial chamber of an Aztec ruler has yet to be located, mainly due to the customary way in which the Spanish built over existing structures. The invaluable information that would be gleaned from such a discovery would be outstanding and perhaps, even monumental.